Every so often, a complex residential roof - of average scale and with relatively small truss spans - arrives for design and estimation at a timber roof truss fabricator. While it may not necessarily be of grand scale, even relatively small yet complex projects can cause frustrations to all along the supply chain – with mounting time and cost implications. Truss hangers not installed due to a mix-up with a different section and detail. De Jager explains that the roof structure of this new residence, with a roof area of a little over 300 m², was designed to carry concrete roof tiles and was, at first, nothing out of the ordinary. "That is until the walls that were designed and built just slightly (less than 5 degrees) out of square, with the roof specified to be square, were taken into account,” says de Jager. “In addition, the building had a cranked section at 40 degrees that further complicated the design and measuring of the site. This resulted in a roof design with over 100 different truss labels – enough to scare some of the most competent of roof installers." A prominent finding of the study revealed that the eventual installation difficulties experienced on site were not ascribed to a single source. De Jager expounds, "In my experience, these issues often arise from a combination of factors, starting with uninformed clients and inexperienced or easily-conceding architects. Add to this designers working under pressure and installers lacking in effective communication and it becomes clear how the installation on site can spiral out of control." "In these situations, installers can be easily overwhelmed by the sheer complexity of the design and even experienced installers can start making novice mistakes. At this point, planning and good communication are abandoned, a ‘make-do’ approach is adopted, and any disconnect between designer, installer and inspector further exacerbates the problem," says de Jager, adding, "Insufficient or incomplete details given to the roof designer by the architect can also lead to assumptions being made about the roof design, which can later develop into disputes once the trusses have been fabricated. Another factor contributing to these installation difficulties could also be the lack of special installation details from the manufacturer’s designer that should accompany the drawings when sent to site for the installer." 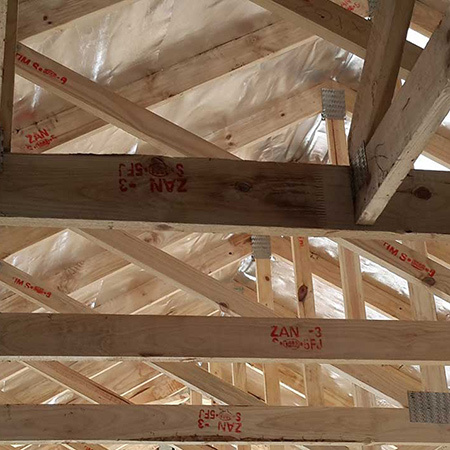 The misapplication of the universal nailing details as specified by the various Systems for roof truss manufacturing in Southern Africa is a common error that occurs on site. "Nailing details are often applied incorrectly at the perpendicular connections of jack trusses to girders at open hips or 90-degree infill hips," remarks de Jager. 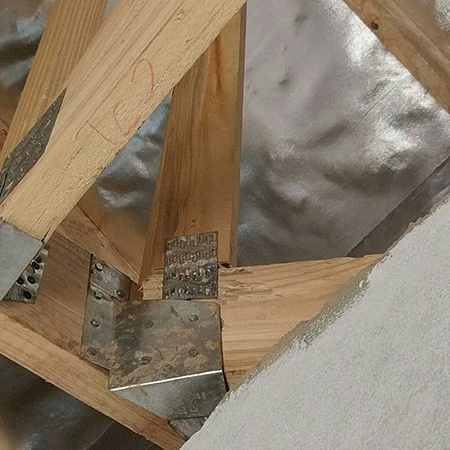 Inadequate or incorrect nailing of truss hangers, bracing, truss and batten connections is another common error. De Jager notes, "Because of the overwhelming complexity, confusion of bracing items, cleats, hanger and other details can occur, with many being switched around and some even being left out completely. In the same way, several of the small trusses can be neglected, because the main trusses are repeatedly repositioned in an attempt to ‘make the roof fit’. These are then left out of the structure, causing some unstructured open spaces in the roof, which then leaves the adjacent trusses to carry an additional load that they were not designed to bear." Another major issue that can arise is the on-site modification and cutting of trusses by installers without the prior consent and instruction detail from the designers. "Not only does this compromise the integrity of the roof structure, it is also not necessary in most cases. The trusses might merely need to be positioned correctly," says de Jager. "Finally, many support blocks on internal walls that were meant to temporarily aid in the positioning can be forgotten and left in place. 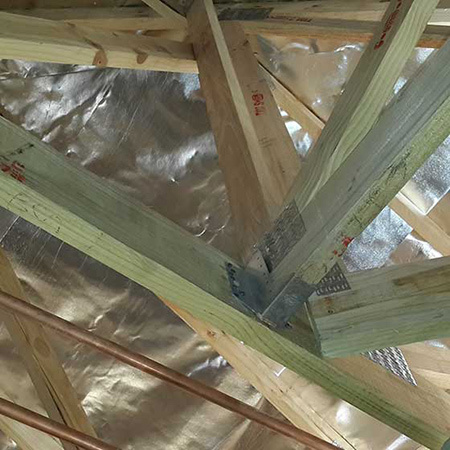 If this is not picked up by an inspector prior to roof loading, severe bending moments around these points can be created, for which the trusses were not designed, and they can fail at these or other points." "Sometimes, installers will start loading the roof tiles before the structure has been inspected, which can have damaging results. 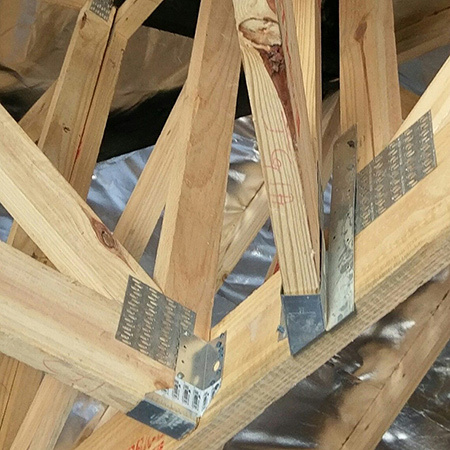 In complex roofs where bracing and metalwork can easily be installed in the wrong positions or neglected, long compression truss members can buckle and tension members can pull out of nail plates," comments de Jager. "When a collaborative approach is not possible from the start of the project, it can be of great benefit to all parties to get a competent roof inspector involved from the start of the roof installation," advises de Jager. "Depending on the complexity and scale of the project, the roof inspector would visit the site at least daily to ensure that mistakes are not compounded and that the communication between installer and designer is clear. The inspector or engineer responsible for signing off the roof should also be able to observe and request any required special details in a timely manner. These simple steps can greatly reduce the time spent on site and ensure an accurate and efficient installation process," he concludes. For more information or to find an ITC-SA-accredited roof inspector near you, visit www.itc-sa.org.